(nee Gebhard) Born on earth to live in heaven, May 9, 1925 – February 28, 2017. Beloved wife for 72 years of Edmund F. Leschke, Sr. Cherished mother of Dennis (Debbie), Dale, Donald (Gayle), Edmund Jr. “Buddy”, Beverly, Barbara, Alvin, Joseph, and Jeannie (Barron) Peterson. Loving grandmother of the late Dwane, Heather (Scott), Seager, Dona, Martin, EmmyLou, Deanna, Zachary, April, Braedon, and Benjamin. Loving great-grandmother of Madison, Liberty, Ella, Owen, and Lincoln. Dear god-sister of Janice Proffitt. Further survived by other relatives and friends. Joan was fond of her wolves and Joan is now running with the wolves. 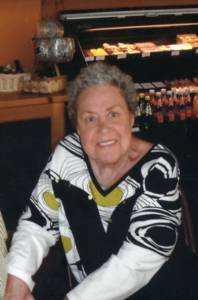 Visitation Saturday, March 11, 2017 at St. Matthew Parish, 9303 S. Chicago Road, Oak Creek, WI 53154 from 11:00 AM until the time of the Funeral Service at 1:00 PM. Interment Holy Sepulcher Cemetery.